Former Los Angeles TV sportscaster and current HBO boxing announcer Jim Lampley was arrested late Wednesday afternoon by San Diego County sheriff's deputies on suspicion of domestic violence and other counts, authorities said. A brief news release from the Sheriff's Department indicated that Lampley, 57, also was being held on suspicion of violating a restraining order and dissuading a witness. TMZ has learned that veteran sportscaster Jim Lampley was arrested this evening outside of San Diego, CA on felony charges of domestic abuse. Sources say that because of previous complaints, Lampley was arrested by an investigative team at his girlfriend's home in Encinitas, CA. Lampley was once married to anchorwoman Bree Walker. 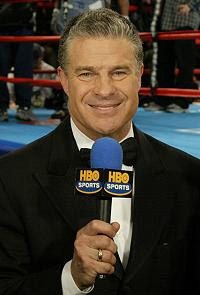 Lampley has been a favorite of mine for quite some time now, and I wonder how this will affect his attendence of the January 20th Ricky Hatton fight? Side Note: I'm not sure if he was stalking Bree Walker or another unlucky lass, but Bree Walker is the anchorwoman you see on all those plastic surgery pieces. Seriously, Jimbo....if it is Bree....come on, look at her.....just leave it alone. It's not worth it. It's the wrong thing to say, but it was creepy to a kid. Apparently it wasn't Bree...it is TMZ, so take what they write with a grain of salt.